Heat oven to 350°F. In medium bowl, mix Cookie ingredients with fork until soft dough forms. On lightly floured surface, roll out dough with rolling pin until about 1/4-inch thickness. In small bowl, stir together Cinnamon-Sugar ingredients. Sprinkle cinnamon-sugar evenly over cookie dough. Roll up dough into tight spiral; cut into 1-inch slices. Place on ungreased baking sheets. Bake 8 to 10 minutes or until set. Remove from baking sheets to cooling racks. Cool while making icing. In another small bowl, stir together Icing ingredients until smooth, adding enough milk for piping consistency. Spoon icing into resealable food-storage plastic bag. Seal bag; cut off tiny bottom corner of bag. Pipe icing over top of each cookie. Let icing set until firm before serving or storing. Keep your cookie sheet clean by covering it with parchment paper. 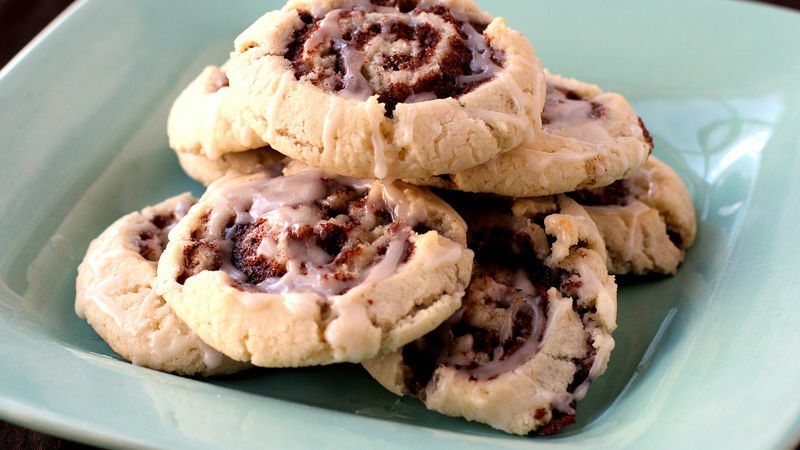 Peanut Butter and Chocolate Cookie Rolls! Change up the flavour of these cookies by using Betty Crocker™ peanut butter cookie mix, and adding a tablespoon of unsweetened cocoa powder to the icing recipe.